Westgate - South Western Rail: What’s on our Trains? 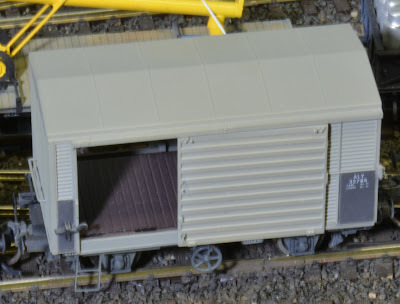 Modelling Queensland Railways in H0n42 and NSWR in HO. There is various methods to check out your latest master piece or what you are doing on the layout. One of the best methods is to photograph it. You would be surprised at what you see looking at your models/operations on the computer screen. Most of my wagons have loads and for some time I have been doing presentations at conventions on loads carried on our rail networks. Reviewing the video on “Train spotting at Wyandra” https://youtu.be/PvB30g4tFRI I noted I was not following my own advice in the presentation. !!!!! In the video there were two QR trains that crossed at Wyandra, one train travelling west (an Up train) crossed a train travelling east (a Down Train). On our layouts that is one train coming from our left and the other coming from our right. Both my trains had much the same loading. Both trains were conveying motor vehicles of the same era, and box wagons with doors open. If they were two coal trains, one would be loaded and the other empty. It’s much the same for freight / goods trains. Trains travelling away from the capital or major coastal cities convey loading for country towns and isolated sidings. The freight on these trains is goods to keep these communities going, food stuffs, milk, building materials, machinery, new cars, trucks and tractors, fuel etc. Trains coming back have the same wagons but would have different loading. Here is Queensland in the sixties the largest product would have been wool. The train travelling west has all wagons conveying freight, the other train travelling east has a number of empty wagons. 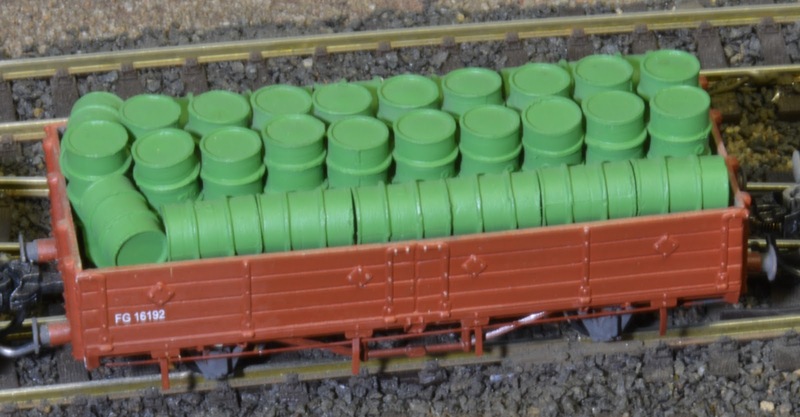 Yes, some wagons look the same loaded or empty, fuel tankers, grain wagons, box wagons to a point, and stock wagons. Most of these travel empty one way and loaded the other way. Fuel tankers and box wagons go out loaded and return empty. 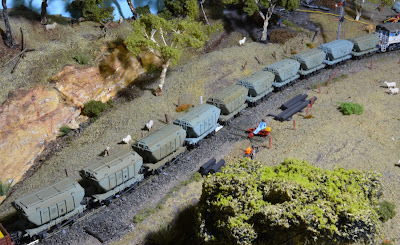 Grain and stock wagons go out empty and return loaded. Empty box wagons coning back from country areas may have their doors open regardless of instructions to keep them shut. The big difference is open and platform wagons, going out a wagon could have a load of timber, on the return the wagon could be loaded with wool or be empty if not required to fill orders. Some loads in open wagons going out do come back, I.e. drums. Small quantities of some fuel products (kero, Av-gas etc.) and oils are conveyed in 44 gal/200 litre drums. Going out loaded these drums are loaded upright. When empty the drums are returned to the sender. There is no hard and fast rules for returned empty drums. The object of the excise is to load as many as possible into one wagon. This is subject to the height of the wagon sides. If an item of freight is six inches below the top of the doors, no securing is required. If the drums are stacked higher above the sides, a rope over the top was in order. If it was not done, the shunters took great delight in seeing how many drum they could flip off the top. Prior to the early 1990’s, loose shunting was the order of the day. Wagons without air were kicked by the shunt engine and allowed to roll freely down a siding until coming in contact with the first wagon, the size of the “BANG” was subject to the speed the wagon obtained before meeting that wagon. All of this was subject to hot or cold bearings, roller bearings, weight in the wagon and the grade. I recall seeing an ALY (roller bearing) wagon rebound four times off that first wagon before stopping. For wool there is loading diagrams showing how to get the maximin number of bales into a wagon. All loads don’t need to be full loads. You may find loading methodology may change over time. Wool is one example when the bale material changed to a polly material. Some western stations had set orders for wool. Charleville wagon orders showed equal to 20 F of flats for the wool ramp each day. Within QR open wagons were called flats, one “F” was equal to 15 feet, that is one four wheeled “F” wagon, one eight wheeled “H” wagon was equal to 2F. Red circle (express freight, 50 MPH/80 Km/h) HJSF, HJST, HSA were referred to as red spot H’s. The order would have a mixture of both four and eight wheeled wagons. Tarpaulins used on loads going out are should not to be left on the floor of an empty open wagon. Tarps not required for retuning loading (wool) were folded and sent back on passenger trains or in box wagons. Many open wagons returning from country locations came back empty. Often dunnage (timber/tyres/pallets etc) used to secure a load arriving at the station was left on the wagon floor after unloading. About every two months a Traffic Inspector would arrive at your station unannounced to carry out a station inspection. This inspection was written up in the Station Inspection book. The Station Master would action all unsatisfactory items before sending the original copy to the General Manager. The inspection covered all aspects of station work, accounting, safe working, and general condition of the place. 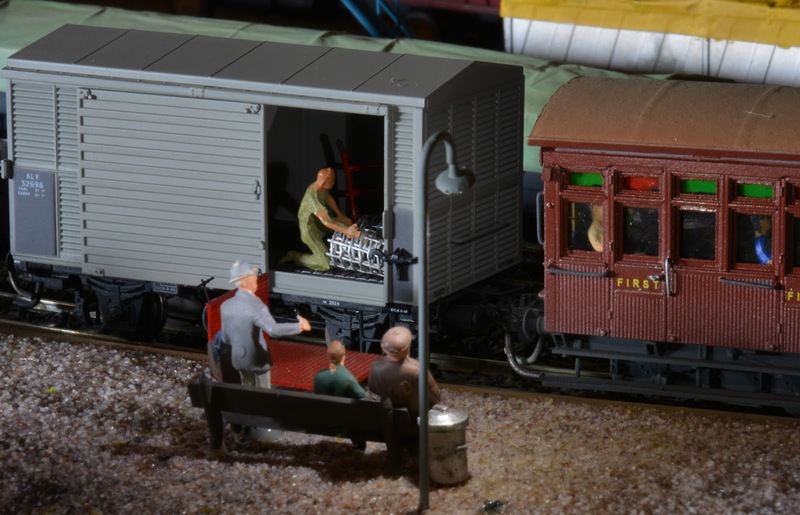 To keep station yard clean and tidy, station staff would toss rubbish into empty open wagons. The Working Time Table allocates trains and days water wagons are to be conveyed on trains. Trains carrying out watering duties, the water wagons are on the lead behind the locomotive. Water wagons returning to depot stations are marshal within the train. I think a lot more could be said on this subject, maybe another blog page down the track. From the early 1960’s, car were conveyed on platform wagons set up to transport wheeled vehicles, SMS (wagons 30 feet long and shorter) and SML (wagons over 30 feet). Later on this classification changed as various different size wagons were added to the fleet. Open wagons were used also. These wagons on trains travelling to country locations carry new cars, trucks, tractors, caravans, farm machinery etc to country dealers for sale. Country trade in for new cars were often sort after in the city due to less rust in their metal body. On the return journey the wagons mostly went back empty, from time to time they may of carry an earlier model vehicle. Plus an odd caravan or machinery item requiring repairs could be returned on the wagons. 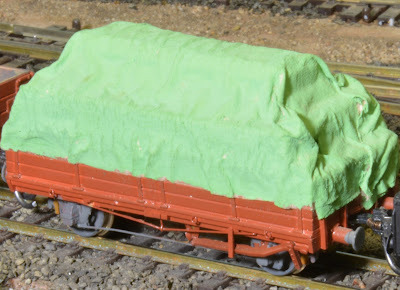 If we have a look at goods trains back in the 1960’s /70’s, you will find most goods trains had a number of box wagons marshalled on the guard’s van. Some trains also had an ice wagon or two in this consist loaded with fruit and milk. 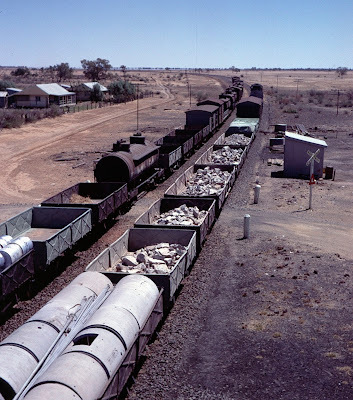 Road wagons carried small quantiles of goods for various stations on the line. This goods was unloaded by station staff and or the Guard. Goods item for station further down the line was also loaded into these wagons. Small items for isolated stations/siding would be placed in the van with the Guard. Each division had a pool of trade/skilled workers, most were required to move around their area of the division, often in remote locations. Most had a home station within the division. These employees did so in camp wagons. Prior to early 1970’s, camp wagons were very basic, mainly converted box wagons, if you were lucky you may have scored a converted carriage. For this blog I’m looking at there place on a train. On a shunt train they would be marshalled within their destination block. On through trains with workers travelling in their camp wagons, the camp wagons were marshalled towards the rear of the train near the guards van subject to roads wagons. They would move back and forward across they area of responsibility. More about this group of workers can be found in my blog “Paper, Paper” November 2018. In my latest video “Train spotting at Westgate Branch Points” https://youtu.be/zbPD3j3QDVA has the trains coming and going reflexing prototype operations more correctly. Kadee Couplings on Narrow Gauged Wagons.